Snippets of Jack: "I Can Honestly Say I'm Glad To see You"
"I Can Honestly Say I'm Glad To see You"
Jack is feeling a little worried now that there's a giant squid chasing after him. He's so worried in fact that he leaves his first and only love. He goes to an small island that appears to be uninhabited. But little does He and his crew know this island is filled with tons of pelegostos. They lock the crew in bone cages and bring Jack, who they think is a god, to a huge thrown and paint eyes all over his face while children come and give him authentic toe neckleces. While sitting on his throne the natives bring in person tied to a pole upside down. Do you know who it is? Correct! it is Will Turner. Will: "Jack? Jack Sparrow! I can honestly say I'm Glad to see you." Well who wouldn't be? Jack gets up and walks to wil and pokes him. Alittled confused will says, "Jack, it,s me. Will Turner." Not buying it Jack speaks to one of the gaurds in the native tongue. Now Will is getting a little worried Jack got memory-loss or something. Will: "Tell them to let me down!" Again Jack talks to the gaurd but will has one last card up his sleave. Will: "Jack, the compass that's all I need. Elizabeth is in danger. We were arrested for saving you! She faces the gallows." YAY! Let's celebrate! Now I'm no expert in pelegostoese but I think Jack tells them to bring will to the cages though im not sure how they do it considering there's no door. . .But before Will leaves Jack has a last word....or two: "Save me." Now you may not no why he needs saving. The reason is He doesn't enjoy getting eaten to release his godliness. But unfortunetly the islanders do. They Jack tie to a pole and hang him over a pile af wood. But right when the gaurd is about to light the wood on fire a boy runs up and tells everyone that the prisoner(Will and the crew) are escaping. The gaurd drops the torch aruns to stop the prisoners like everyone else. So now Captain Jack Sparrow is trapped above a burning fire. What will he do? Well be Jack Sparrow of course! He jumps out abegins to run with the pole still tied to his back. While running he spots a child holding a fork and knife for the feast. Jack grabs the knife and starts sawing at the ropes but doesn't get far because to adult cannibals start throwing fruit at him. All the fruit gets stabbed by the pole and stays there. Finally bored of this game Jack runs and flips over the giant canyon and almost makes it. But the dumb fruit weighs him down and he falls. On the bright side he didn't get hit by the fruit any more. After lying on the ground for a while Jack gets up and runs to his ship and says his famous line but of course is interrupted by a rude wave. Jack: "Alas my children this is the day you shall always remember as the day you almost(wave). 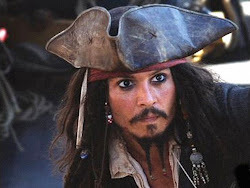 . . Captain Jack Sparrow."